UNITED NATIONS — The United States announced Tuesday that it will abstain for the first time in 25 years on a U.N. resolution condemning America’s economic embargo against Cuba, a resolution it had always vehemently opposed. The announcement by U.S. Ambassador Samantha Power ahead of a vote on the resolution was greeted with applause in the 193-member General Assembly. Power said the U.S. was abstaining because of President Barack Obama’s new approach to Cuba, but she made clear that the United States “categorically” rejects statements in the resolution suggesting the embargo violated international law. An abstention will effectively pit the Obama administration and Cuba with the world body against the Republican-led Congress, which supports the 55-year-old embargo despite the U.S. resumption of full diplomatic relations with Cuba. The U.S. has always opposed the annual resolution condemning the embargo. 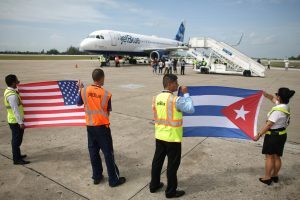 But an abstention would be in keeping with the administration’s belief that the embargo should be lifted as part of normalizing diplomatic relations with Cuba. General Assembly resolutions are nonbinding and unenforceable. But the 24-year-old exercise in which the U.N. overwhelmingly votes to condemn the embargo has given Cuba a global stage to demonstrate America’s isolation on its Cuba policy. The administration had considered abstaining from the vote last year, but concluded it could not do so because the resolution did not reflect what it considered to be the spirit of engagement between Obama and Cuban President Raul Castro. The 2015 vote ended up 191-2 to condemn the commercial, economic and financial embargo against Cuba; it was the highest number of votes ever for the measure. Only Israel joined the United States in opposing the resolution. Obama and Castro announced on Dec. 17, 2014, that they were restoring diplomatic ties, which were broken in 1961 after Fidel Castro took power and installed a communist government. On July 20 last year, diplomatic relations were restored and embassies of the two countries were reopened, but serious issues remain, especially the U.S. call for human rights on the Caribbean island and claims for expropriated property. Lee reported from Washington. Associated Press Josh Lederman contributed to this report.